Bankruptcy often has a bad reputation. Many people assume that if you file for Chapter 7 bankruptcy you are a poor money manager or that you have bad spending habits. Often times, however, this is simply not true. People file bankruptcy every day for a variety of reasons. These may include an unexpected, serious life change, such as a loss of employment or significant medical bills. Bankruptcy is a legal benefit that you have the right to exercise. There are quite a few situations where filing for bankruptcy makes much more financial sense than continuing to struggle with large debt and unethical creditors. In many circumstances, there comes a point where you can no longer handle your ongoing obligations, and you start looking for other options. Surprisingly, you may want to consider filing for Chapter 7 bankruptcy long before you start feeling hopeless. So, when should you start thinking about filing? The answer may surprise you. There are several types of bankruptcy available. They all have the same purpose—to help you get your debt under control—but they are all slightly different. Individuals are permitted to file Chapter 7 and Chapter 13 bankruptcies. In some situations, high asset individuals may also file for Chapter 11 bankruptcy. 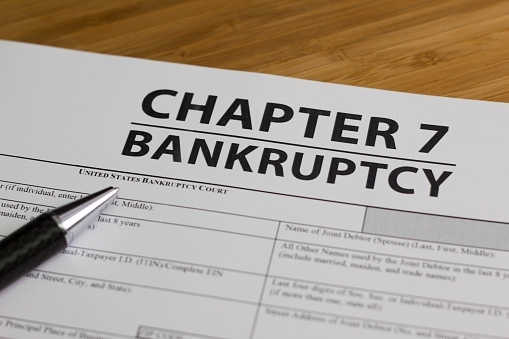 Chapter 7 bankruptcy is commonly known as the “liquidation” type of bankruptcy. Essentially, the debtor will value all his or her assets, sell the ones that are not exempt, and that money will then go to the individual’s creditors. Often, even all the liquidated assets will not cover the debt owed, but that really does not matter. Through the bankruptcy process, the creditors are forced to “take what they can get” and move on. There is no obligation to pay creditors over time or any more than you can gain from the sale of assets. As part of this process, the debt is “discharged” or wiped away as if it was completely satisfied. Many people wait until they have been struggling with debt for years before they begin to consider filing for bankruptcy. However, in many situations, filing earlier could have saved you significant mental anguish, time, and money. Although other sources provide you with “tests” of whether you should file bankruptcy, the choice is yours alone—some people absolutely refuse to file, even when they should, and some may be too eager to file. Although every bankruptcy case is unique, many Chapter 7 filers have similar attributes. If you think you fit into the below description, it would be a good idea to talk with an attorney about your financial options. Most Chapter 7 filers struggle monthly to keep up with their recurring obligations. They are concerned about losing utilities or keeping their home. They may use credit cards to pay for necessary expenses on a regular basis. Their monthly bills often consist of ordinary living costs (food, clothing, utilities, etc), credit card payments, student loan payments, medical payments, or some combination of these. Some Chapter 7 filers use payday loans or personal loans frequently, but not always. Many Chapter 7 filers do not have much in the way of assets. They may be renters and own an older car, or no car at all. Some live with parents, friends, or siblings. Others have houses that do not have much equity or are in serious need of repair. One of the reasons that Chapter 7 bankruptcy works well for these individuals is that they do not have to give up large assets because they simply do not have much equity or all their assets are exempt. Debtors must also qualify for Chapter 7 bankruptcy by going through the “means test.” If debtors do not pass this test, then they must file Chapter 13 or cannot file bankruptcy at all. Don’t struggle for years if this situation describes you; talk to an attorney the moment you realize your debt may be out of control. At the very least, you will understand your options so you can make an informed decision about your financial future. Is Chapter 7 Bankruptcy Really the Right Choice? Take some time to do your own mini liquidation analysis. Consider what all your assets are worth, such as your car, house, retirement accounts, savings accounts, cash on hand, etc. Then, compare that amount to your amount of debt. Is your debt significantly higher than your assets? Then, you may want to consider filing for Chapter 7 bankruptcy. You can file and wipe out all your dischargeable debts and then begin to rebuild your financial wellbeing, essentially from scratch. The simplified liquidation analysis described above is similar to what an attorney will do when he or she examines your finances to determine if bankruptcy is the right option for you. However, because bankruptcy lawyers have extensive experience in this type of analysis, it is a good idea to discuss your options with a professional. Having someone you can trust to do this examination will be extremely beneficial in deciding whether bankruptcy is a good idea for you. If it is not, your lawyer can often suggest alternatives to bankruptcy as well. While it is challenging to discharge student loan debt, it is not impossible. Your attorney can evaluate your situation to determine if you may be a candidate for student loan discharge. Many people mistakenly assume that they will have to get rid of everything they own in a Chapter 7 bankruptcy. However, lawmakers understand that forcing you to sell even the essentials would not make sense. If the possibility of losing absolutely everything in bankruptcy is keeping you from filing, you need to learn a bit more about the bankruptcy exemptions available for New Jersey residents. Federal and state law allow you to keep some essential assets even if you file bankruptcy. These items may be valued simply to ensure that they meet the permitted exemption, but otherwise, they are entirely excluded from the bankruptcy process. There are other exempt assets as well, and your bankruptcy attorney can help you decide which exemptions will work best for you. Having an attorney you can trust is extremely important. He or she can help you decide whether Chapter 7 bankruptcy is the best option for you and your situation. The team at Scura, Wigfield, Heyer, Stevens & Cammarota has the experience you need to make this difficult decision. Call today for more information: 888-412-5091.